Gently undulating landscape of the Mâconnaise, although there’s rocky formation too, like Mont de Pouilly. Buying wine is like buying chocolate. They both have a world of flavors and attributes to consider. Do you want fruity or deeper earthy tastes? Belgian? Dark or milk? 85%? Then you navigate labels- Costa Rican, single origin, fair trade? You decide on a bar but see local producers as you head to check out. So many choices. The same holds true for wine; consumers have a plethora of decisions to make. There’s white, red, rosé, sparkling. Dry or sweet, light or full-bodied? Maybe French or something from South America? Then you get to region, as well as organic, and on and on. These two aroma wheels have a lot in common! The French #Winophiles continue our journey through Burgundy, focusing on the southern areas of Côte de Chalonnaise, Mâconnais, and Beaujolais. I’m proud to be part of this talented group (list below) where we share insights and knowledge from a variety of angles: area information, wine characteristics, producers, wine pairings, and more. 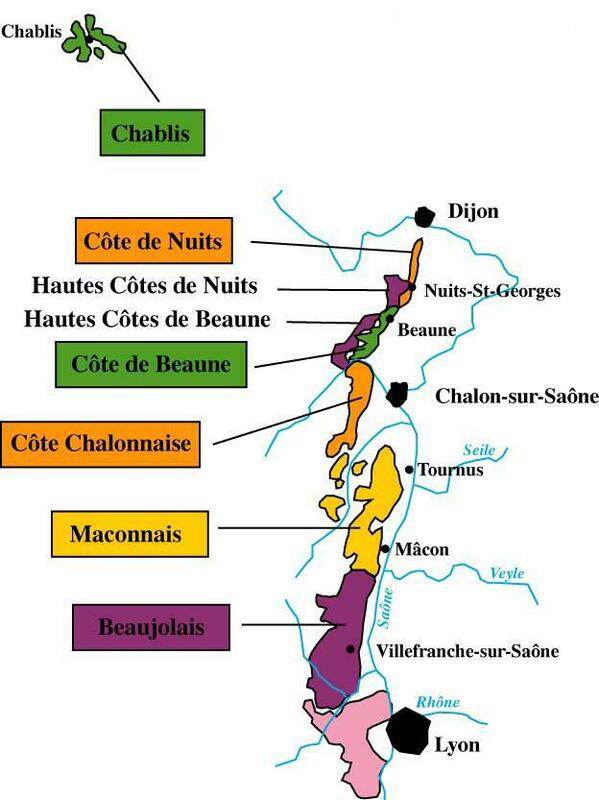 I hope all of our information helps you navigate these southern Burgundy areas so you can pick the right bottle! Believe it or not, it’s difficult to find certain wines in Bordeaux, France where I live. But my perseverance uncovered two wines: a Mâconnaise and a Beaujolais, both found in the southern part of Burgundy. Mâconnaise and Beaujolais are neighbors in the south of Burgundy. 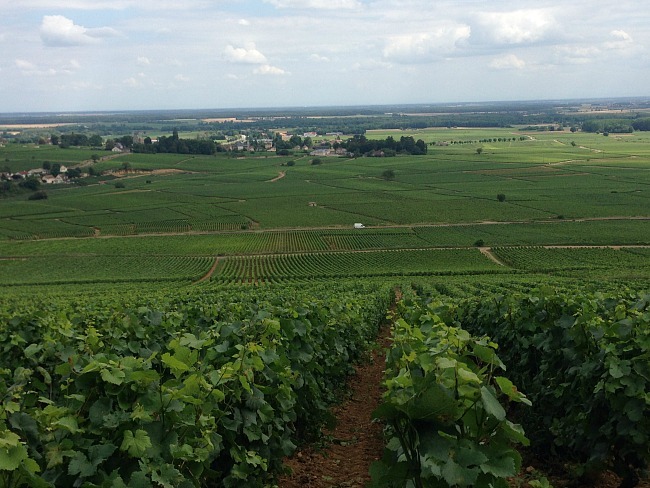 The Mâconnaise sub-region saw its glory days, then the whites of Côte de Beaune took the spotlight. 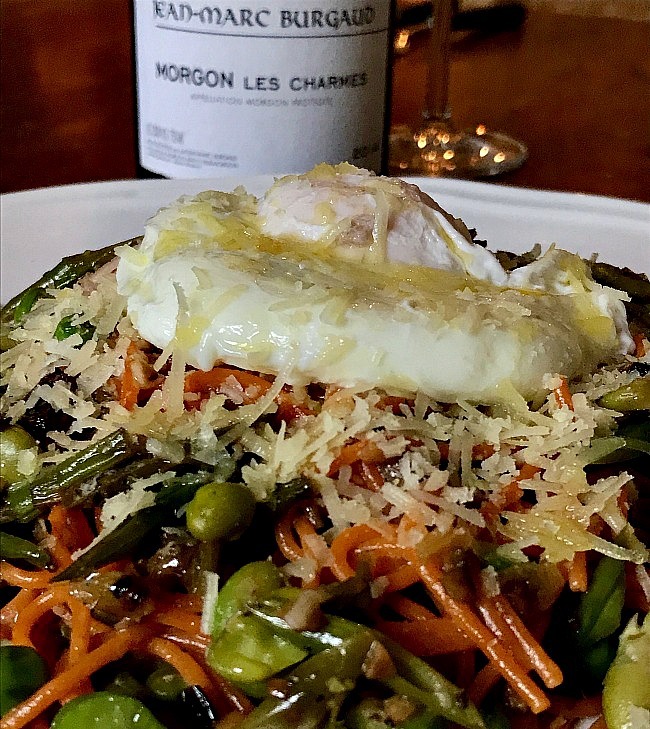 The Mâconnaise is on the verge of rediscovery and for those who like Burgundian Chardonnay but cringe at the cost, the Mâconnaise is your spot! Chardonnay here is fruity, often with Acacia blossoms and peach, and succulent with a certain minerality. And these good-value, quality wines are easy to pair with food. Sébastien took over the winery after his father became ill from pesticides use in the vineyards. His approach is simple, biodynamic viticulture with very low yields. Chardonnay and Pinot are grown on Limestone, while Gamay on Granite. Delphine and Sébastien are members of “Artisans Vignerons de Bourgogne de Sud”, a group focusing on small-scale, crafts-man based agriculture emphasizing soil health. The winery produces red and white wine. Palate: Pronounced, round feel, an almost voluptuous creaminess gives way to crushed shells and tart, green apple. Winemaking: No sulfur or indigenous yeast, a 6-month cool fermentation with a very low temperature, aging in older barrels, no fining or filtration. This gives lots of extraction and that creamy palate feel and taste but bright, freshness is retained. While there’s a large range of Chardonnay styles in the Mâconnaise, this particular style was captivating at a great cost to value ratio. And the pairing with food! The food pairing was right on, a poke bowl riff of mixed greens dressed in sesame vinaigrette, caramelized onions and fennel, avocado, and thinly sliced cucumber sticks. 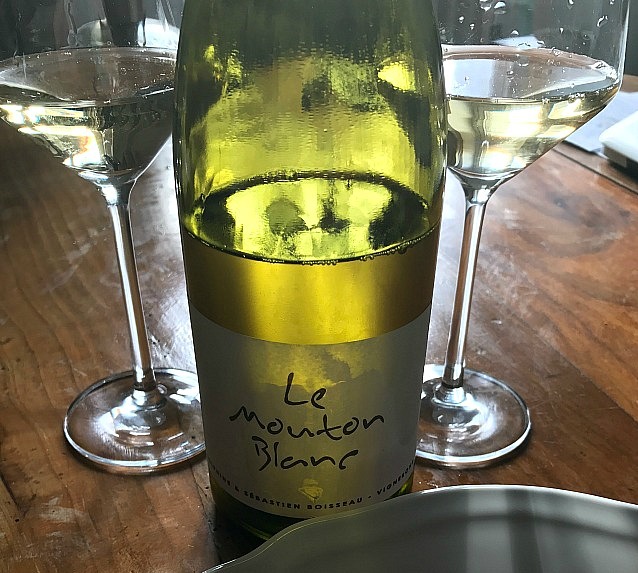 Le Mouton Blanc would go well with grilled salmon, sushi, and other white fish, to name a few. Chicken in a white wine sauce- yes please! Next up- Beaujolais, where Gamay rules and carbonic maceration is common. Beaujolais lies at the southern end of Burgundy. Some say it’s part of Burgundy while others insist not. It’s in between the cities of Lyon (north) and Mâcon (south). There’s much more to Beaujolais than Beaujolais Nouveau! Understanding Beaujolais soils helps to understand the wine. The Nizerand River separates the north and south, with distinctly different soils on each side. Northerly soils are granite and shist resulting in wines with structure and complexity (often drink similar to a red Burgundy). The ten Beaujolais “Crus” are in the north. Limestone and clay based marls are found south of the river- this is where wines are generally lighter and fruitier. 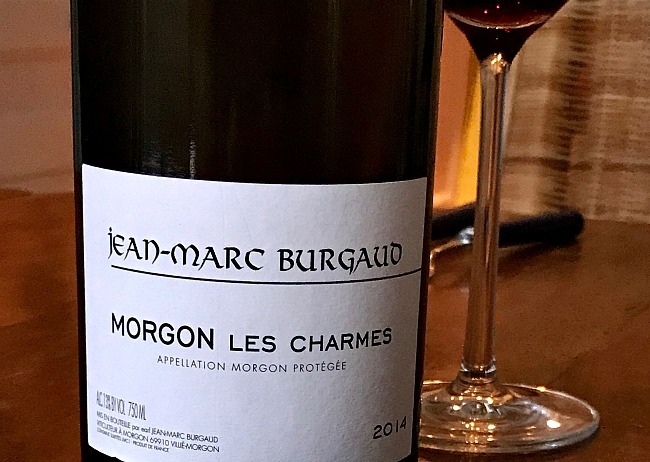 My pick comes from the northern Cru Morgon, known for its ability to age and possessing “soubois”– a vegetative, mushroom like, forest floor quality. This small producer is 50 kilometers north of Lyon. He works his vineyards traditionally and manually using no chemical pesticides. Jean-Marc is not officially certified organic but farms as such. He believes high density vine planting is important for quality, as Gamay vines need competition in the soil to produce grapes with concentration. Aromas: Imagine sitting in a forest, a bowl of cherries and raspberries in your lap. At times the fruit aromas are more powerful, then the forest chimes in with its spicy, earthy smells. Palate: Crunchy black cherry, strawberry, and pomegranate give way to a dusty texture and a zingy fruit feel that softens to lingering fruit and violets on the finish. Firm minerality, lush fruit, energetic and lively. Wine Pairing: Vegetarian pasta with a seasonal fresh bean and pea medley, poached egg, Parmigiano-Reggiano. Mark and I enjoyed this wine slightly chilled (a norm for Beaujolais). It’s perfect for summer with a variety of foods including grilled vegetables, or steak with Simply Recipes chimichurri. If you’re tempted to buy a Beaujolais Cru, look for the village names of Saint-Amour, Juliénas, Chenas, Moulin-à-Vent, Fleurie, Chiroubles, Morgon, Régnié, Côte de Brouilly, or Brouilly. Most white wine in Mâcon is labeled Mâcon-Villages or Mâcon + the name of the wine producing village. Twenty-six villages can legally append their name to the regional Mâcon AOC because they’re recognized as having higher quality wine. For example “Mâcon-Vergisson”, where Mâcon is the AOC and Vergisson is the name of the village. A special thanks to Chris Puppione at Martines Wines! Information about the Wine Aroma Wheel can be found here. Outstanding tasting notes – really capture the character of each wine. Nice touch adding the wine label decoding at the end. Thanks Lyn! 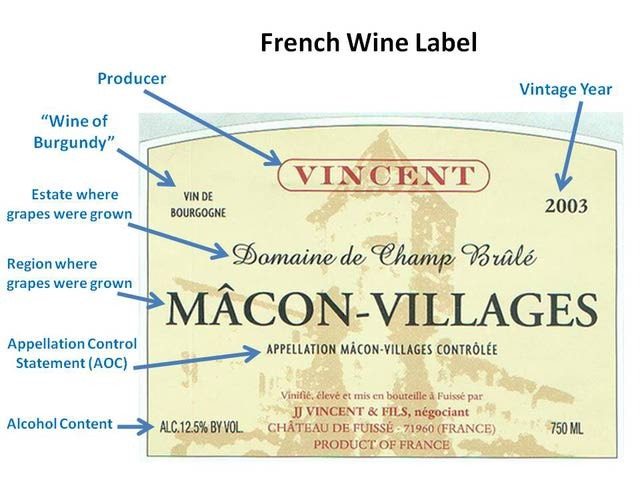 Burgundy labels can be especially hard to decode. Great choices, Lynn. I’m a big Mâcon fan, I’d never heard of that vigneron group. We see that cru Beaujolais here in MN, although I don’t think I’ve had that one. I think the whole “where does Beaujolais belong” thing is so interesting. Maybe they need to take charge and claim their independence from everyone else! I will happily dine chez vous any day of the week! Great dishes and lovely wines to accompany them. I love the Beaujolais Crus and turn to them often when looking for just the right menu pairing. Nice tasting notes. I agree with you about Beaujolais, the location and soil of the vineyards is key. Thanks for joining us. The French #Winophiles are a great bunch. Thanks for your comment Michelle, look forward to more great interaction! I love the flavor wheels and the comparison of wine tasting to chocolate tasting. I like that you showcase two different wine pairings and the meals sound amazing. I really love the aroma wheel, and actually just had an aromatics experience on our trip to Napa. I thought it was interesting to examine my notions about certain smells, and actually compare wine ‘nose’ with the real deal…. Great post, love the examination and your notes. Thanks for sharing! And thank you for your kind words Jill! It’s fascinating to analyze wines for aromas, and to get the “real deal” as you say to see how a certain item really smells. Are we geeks or what?!? Lynn, Nice photo of Mâconnaise showing the landscape contrast from Côte d’ Or. Le Mouton Blanc sounds interesting and a great value. 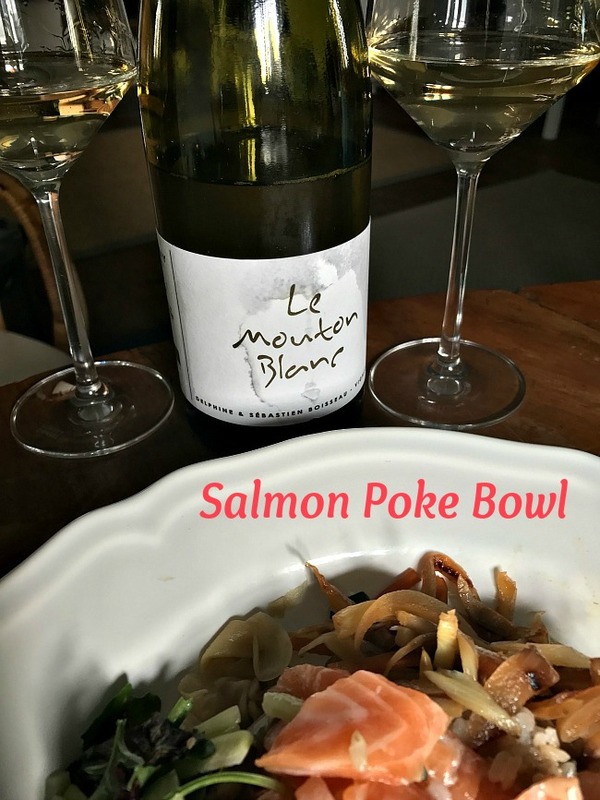 Your salmon poke pairing was perfect. YUM! I need to be on the look out for more Beaujolis, around here they are difficult to find! I now know what to look for, I found the soil difference between north and south of the Nizerand River very interesting! Another great informative post! Cheers to chocolate aroma wheels too! Thanks for your comment Jane. It’s funny because I almost took the paragraph about the differences in soil north and south of the Nizerand River out. But there is a difference and many agree the resulting wines taste different, me included after trying several from both sides. So glad I kept it. Cheers! Very informative! I particularly love the wine pairings. Always a fan of Morgon. That particular Macon is new to me and I will have to look out for it. Looks fantastic with the poke! Nicole, the Le Mouton Blanc is indeed a nice wine, great with the poke! I found it at a small shop in Bordeaux carrying only small producer wines. Loved reading about the Domain and what they are doing in Mâcon-Bray. It is imported but if you can’t find it, let me know and I’ll hook you up with my contact at the US distributor. Hi Lynn, what fabulous tasting notes! They really bring the wines alive. Thanks for linking to my chimichurri recipes!